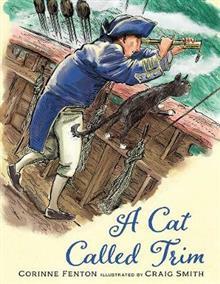 Trim was a cat born for adventure ... This is the true story of a courageous, mischievous and fearless cat called Trim, who sailed with Matthew Flinders on his voyages to map the coastline of Australia and beyond. From best-selling creators Corinne Fenton and Craig Smith, this ch... read full description below. Corinne Fenton has a passion for picture books and is published in Australia and internationally. Her first picture book Queenie: One Elephant's Story was an Honour Book in the CBCA Awards, The Dog on the Tuckerbox was a CBCA Notable Book and shortlisted in the APA and ABIA Awards and Bob the Railway Dog was named a CBCA Notable Book in 2016 with the US version named an outstanding book on the 2017 USBBY OIB Honour list. Little Dog and the Christmas Wish was shortlisted in the Crichton CBCA Awards in 2015 and had the honour of being chosen as the theme for the 2015 Myer Christmas Windows followed by One Christmas Eve chosen as the theme for the 2016 Myer Christmas Windows. My Friend Tertius, published by Allen and Unwin, was a CBCA Notable Book in 2017. Her favourite kind of day is to sit with a new picture book text, searching for perfect words. Craig Smith is one of Australia's most prolific, best-known and well-loved children's book illustrators, with over 400 books published. He has collaborated with many of Australia's best-loved authors, such as Paul Jennings and Doug MacLeod, and has illustrated books for Allen and Unwin including The Big Ball of String, The Boy Who Built the Boat, Heather Fell in the Water, Where Are You, Banana? and I Was Only Nineteen. Craig's work over the last 30 years has been acknowledged in the CBCA Book of the Year awards, as well as in children's choice awards around Australia. In 2011, Craig was awarded the biennial Euphemia Tanner Award, which recognised his distinguished services to children's literature and his encouragement of the joy of reading in children.